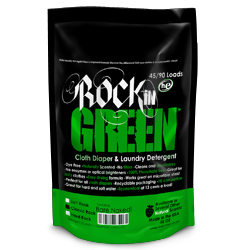 Rockin' Green Detergent is available in4 formulas, 1 pre soak & multiple scents! Hard Rock: This will knock the stink and dirt out of anything you throw at it! This hard water formula is perfect for those that struggle with the toughest of water types! It's great for diapers being washed in hard water. Hard Rock Remix will blow you away! This bag will do at least 45 loads in a top loader and 90 loads in a front-load machine! Classic Rock: This is the sound that started it all. Their classic formula is great for cloth diapers and regular clothes. So use it on everything! This formula is designed for those with middle of the road water, not too soft and not too hard. When in doubt start with classic rock! Platinum Series Dirty Diaper Detergent: This detergent makes cloth diapering less of a frustration for parents who wash their own cloth diapers or doublers and wants them super clean but need a detergent that's also gentle for their baby. It removes stubborn biological residues and funky odors that typically stay behind in cloth diapers, but is safe for a baby's sensitive skin. 45 Loads! 90 Loads in a front-load machine! Platinum Series Active Wear Detergent: You work hard to be healthy and stay fit. Your detergent for your workout clothes should work just as hard to keep them clean and odor-free. This detergent is specifically formulated for those musky, set-in odors and hard-to-rid stain that come from sweat and other biological residues. 45 Loads top load machines, 90 loads in a front loader! Funk Rock Ammonia Bouncer: Do you have funky smelling laundry? Musty towels? Ammonia problems in your cloth diapers that make your eyes water? You need Funk Rock! This 100% natural laundry pretreatment is unlike anything you've tried before. It targets funk at the source and leaves no prisoners. Just add 1 TBSP to a pre-wash cycle to eliminate stinky build up or 2-3 TBSP i a deep cleaning soak as needed for an intense cleaning treatment. Contains no phosphates, parabens, optical brighteners, SLS/SLES, or artifical fragrances, only biodegradable, non-toxic, cruelty-free plant based ingredients. This 16oz bag can do 30 loads.